This article is about the men's team. For the women's team, see Luxembourg women's national football team. The Luxembourg national football team (nicknamed the Red Lions; Luxembourgish: Lëtzebuergesch Foussballnationalequipe, French: Équipe du Luxembourg de football, German: Luxemburgische Fußballnationalmannschaft) is the national football team of Luxembourg, and is controlled by the Luxembourg Football Federation. The team plays most of its home matches at the Stade Josy Barthel in Luxembourg City. Luxembourg has participated in every FIFA World Cup qualifiers since those for the 1934 World Cup and in UEFA European Championship qualifiers since those for Euro 1964. As of 2018, they never qualified for any of these major tournaments. Luxembourg is the nation with the most qualifying campaigns in both of these competitions without ever making it to the finals. The national side of Luxembourg did compete in six Olympic football events between 1920 and 1952. Luxembourg played their first ever international match on 29 October 1911, in a friendly match against France; it resulted in a 1–4 defeat. Their first victory came on 8 February 1914, also in a match against France, which they won 5–4. The national side of Luxembourg competed in six Olympic football events between 1920 and 1952, and survived the preliminary round twice (in 1948 and 1952). In between, Luxembourg started participating at qualifiers for the FIFA World Cup, but as of 2018 they still never qualified. Starting in 1921, the Luxembourg national A-selection would play 239 unofficial international matches until 1981, mostly against other country's B-teams like those of Belgium, France, Switzerland and West Germany, as well as a team representing South-Netherlands. After their last Olympic tournament in 1952, the national team also started playing in qualifying groups for UEFA European Championships, but could not reach the major European tournament end stages. The only time that the team was close to qualify was for a European or World Championship was for the Euro 1964. In the first qualification round they defeated the Netherlands with a score of 3–2 on aggregate after two matches. A Dutch newspaper commented this stunt after the second match with "David Luxembourg won with 2–1 [against Goliath Netherlands]". In the round of eight, Luxembourg and Denmark fought for a spot in the final tournament. The winner was decided after three matches; Denmark was the winner with a total aggregate score of 6–5. When the national team does win a competitive match, they are often celebrated by national media and fans, as was the case after a 2–1 win against Switzerland in 2008. On 3 September 2017, Luxembourg held France to a 0–0 draw at Stadium Municipal in Toulouse, France. It was the first time France had failed to win against Luxembourg since 1914, when Luxembourg won 5–4. On 10 November 2017, Luxembourg pulled off an upset by defeating Hungary 2–1 in a friendly. Traditionally, the badge on Luxembourg's team outfit displays a shield very similar to Luxembourg's lesser coat of arms, a red lion on a white-blue striped background – hence the team's nickname Red Lions. In modern times, the team played home games in entirely red strips, in accordance with their nickname, and wore white as away colour. The Luxembourg national team normally plays its home matches at the Stade Josy Barthel in Luxembourg City, the national stadium of Luxembourg. At this location, the national team played 235 games by August 2015, including unofficial games. It is also used for rugby union and athletics. Originally called Stade Municipal after its construction in 1928–1931, it was entirely rebuilt in 1990. Since July 1993, it has carried the name of Josy Barthel, the 1500m gold medalist at the 1952 Olympics and Luxembourg's only Olympic gold medal winner. The stadium is also home to the biggest athletics club in the country, CAL Spora Luxembourg. The spectator capacity is 8,000; some seats are under cover, some in the open air. In 2004, the Luxembourg Football Federation selected Louis Pilot as their Golden Player, Luxembourg's greatest player of the past 50 years. The following players were called up for the Euro 2020 qualifying matches against Lithuania on 22 March and Ukraine on 25 March 2019. Caps and goals as of 25 March 2019, after the match against Ukraine. The following players have also been called up to the Luxembourg squad during last 12 months. As of 25 March 2019 after the match against Ukraine. *Two of these seven matches, played against the Indonesian clubs Pardedetex and NIAC Mitra (that ended in 1–0 and 2–1 wins for Luxembourg, respectively) are not regarded as full internationals by the Luxembourg Football Federation. ^ a b c d e f Barrie Courney (4 Dec 2014). "Luxembourg – List of International Matches". RSSSF. Retrieved 31 August 2012. ^ Barrie Courtney (8 Mar 2005). "Luxembourg – List of Unofficial International matches". RSSSF. Retrieved 12 September 2015. ^ "Schwartz' droombeeld werd nachtmerrie voor publiek". Nieuwsblad van het Noorden (in Dutch). 31 Oct 1963. Retrieved 23 Aug 2015. ^ "RTL Lëtzebuerg". De Journal. 7 September 2008. ^ "World Cup qualifying recap as France are held by Luxembourg and Belgium qualify for Russia 2018". Mirror. 3 September 2017. Retrieved 3 September 2017. ^ "France coach Didier Deschamps was left "infuriated" by his side's failures in front of goal in their goalless draw with Luxembourg, a result labelled "historic" by his opposite number". BBC Sport. 4 September 2017. Retrieved 4 September 2017. ^ "Stade Josy Barthel, Lëtzebuerg". eu-football.info. Retrieved 23 Aug 2015. ^ "Unique person for a unique place" (PDF). GSSE News – The Official Newspaper of the Games of the Small States of Europe in Luxembourg 2013. Luxembourg. 27 May 2013. p. 3. Retrieved 22 October 2013. ^ "Les entraîneurs nationaux du Luxembourg" (in French). profootball.lu. Retrieved 31 August 2012. ^ "Cadre". Fédération Luxembourgeoise de Football. Retrieved 12 Sep 2015. ^ "Golden Players take centre stage". UEFA. Archived from the original on 2008-05-19. Retrieved 2008-05-24. ^ "Joueurs sélectionnés" [Selected players]. FLF.lu (in French). Luxembourg Football Federation. Retrieved 13 March 2019. ^ a b Mamrud, Roberto. "Luxembourg - Record International Players". RSSSF. Retrieved 8 February 2019. ^ "Marah Halim Cup (Medan, Indonesia)". RSSSF. Retrieved 2 October 2013. 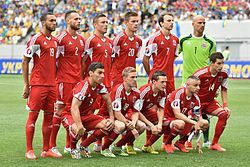 Wikimedia Commons has media related to Luxembourg national football team.